I thought I'd share some of my quilt design process today. This time I'll use a hand drawn design rather than a design on the computer. Last fall I purchased a floral fabric that reminded me of my neighbor's PeeGee Hydrangea. The hydrangea is just on the other side of the fence. Each summer it leans over into my yard. It used to peek through the slats my old picket fence! It's a very beautiful, and very welcome, visitor! 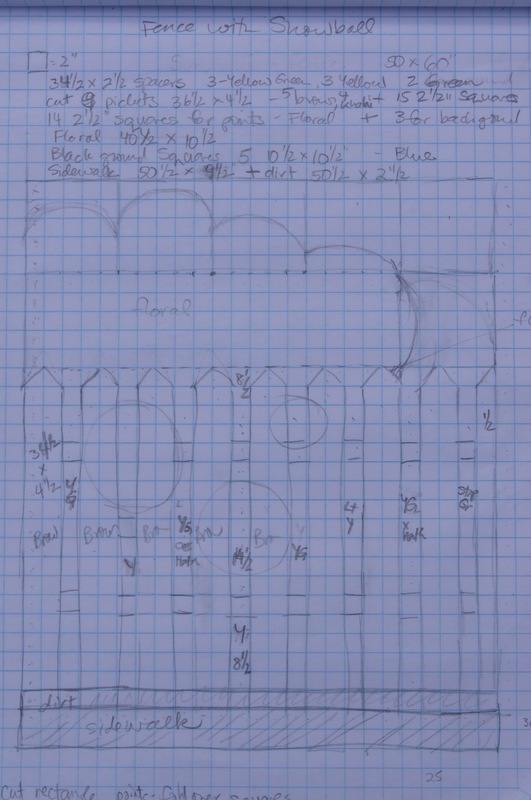 When I purchased the fabric, I made a rough sketch of my quilt idea in my sketch book. A few weeks ago I decided to start working on the quilt. I looked at my original sketch. I liked the concept but thought I could do better with floral blocks at the top of the fence. This time I sat down with my graph paper and redesigned the quilt using a grid. Not only is the revised design better, but the graph paper's grid provides precise measurements for cutting the fabrics for the quilt. In my next post, I'll show you how the quilt is coming together.